Anyone who spends much time with Cate, who turns 4 in less than a month, knows she loves to sleep with her “polka dot” pink blanket. One side is that soft material that has the raised circles and the other side is satin. 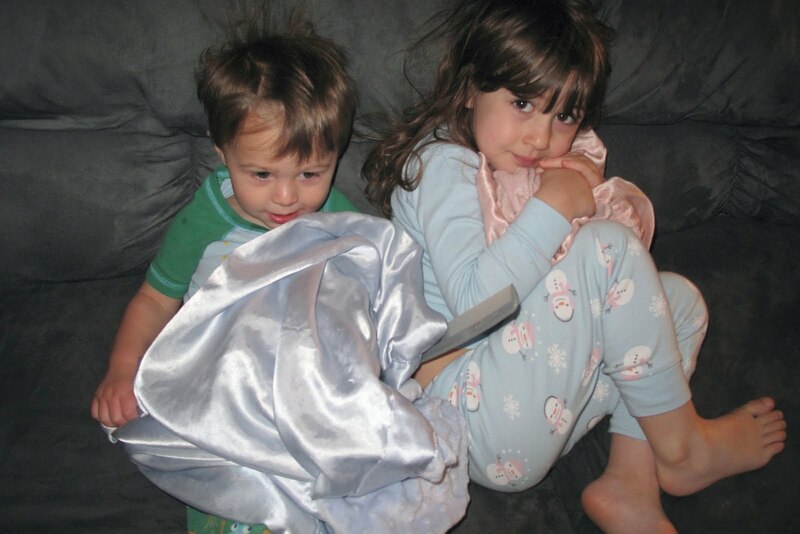 When she was smaller — like Ben’s age — she’d request “that” blanket if we tried to substitute another similar pink one for naptime or bedtime. She still likes that blanket. And she likes her 16-month-old brother to like his blue version. Ben’s always liked to sleep with blankets near his head or his head near the bumper. But he hadn’t shown favoritism toward a blanket until recently. And it’s that blanket. The one like his sister’s. The one she picked out for him in a store before he was born. He’ll walk around the house with it, sometimes on his head, and he’ll find it when he’s ready for a “nigh night.” His version of that blanket comforts him like his sister’s comforts her. To me, it’s sweet she wants him to know that kind of comfort, as long as it’s his blue one and not her pink one.